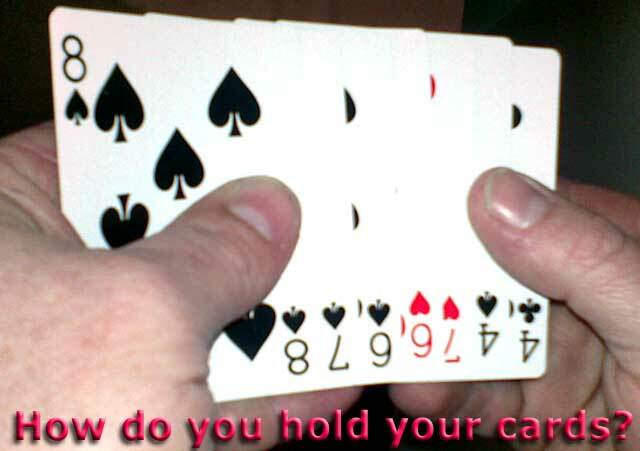 THE MANNER OF HOLDING CARDS in the hand is related to a card player’s needs to view his/her hand in a logically organised way, perhaps categorised into sets or sequences, usually reading from left to right. 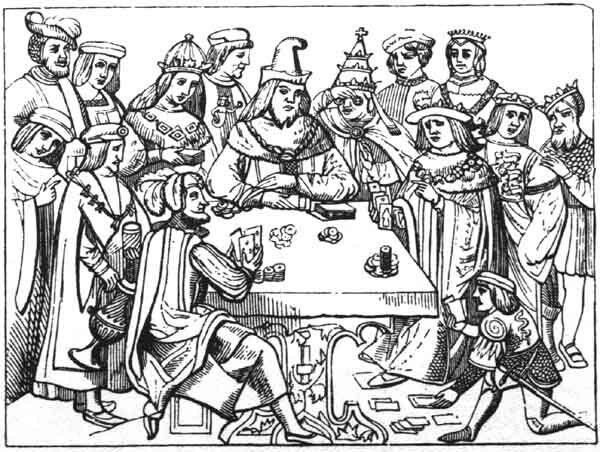 In their early days, cards were introduced into a society with different levels and divisions of literacy than those which we take for granted today. Furthermore, early suit systems were not the abstract and logically categorised symbols we use today - two red and two black - but were everyday objects such as acorns, birds, flowers, wild animals, etc. relating to everyday experience. As soon as they were being mass produced by printing they appealed to a largely pre-literate, illiterate or lay population, unversed in the refinements of formal logic, grammar or acquired literacy. 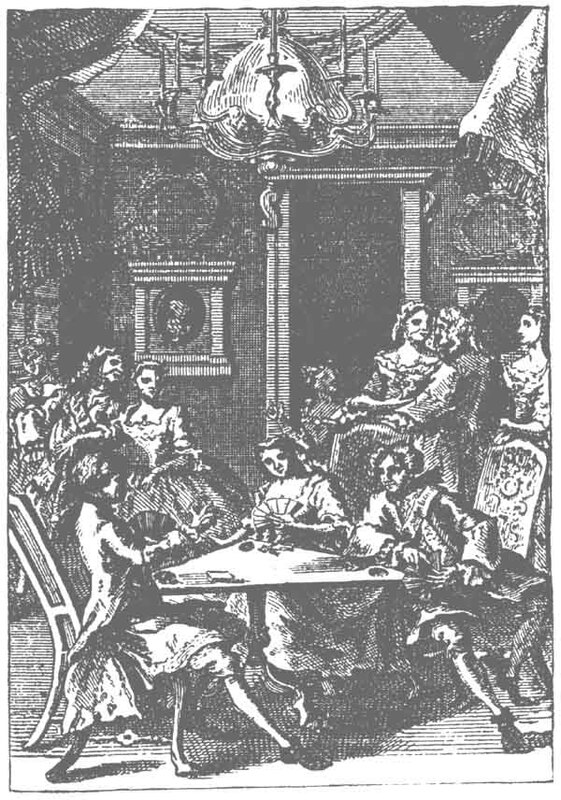 A glance through playing card books showing early prints of card players does not always suggest that neatly fanning the cards was the norm. 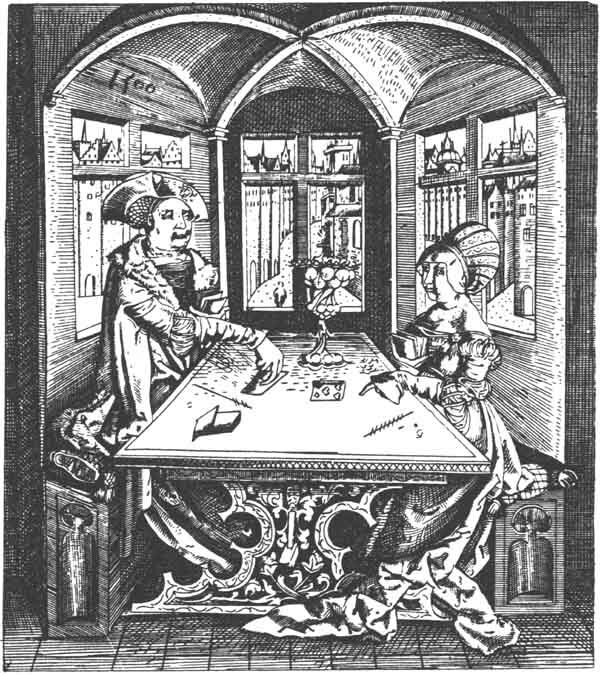 For example, in the print of “The Duke and Duchess of Bavaria playing at cards” of c.1500 (see figs 4 & 6) the two aristocrats are shown holding their cards one just above the other, in a single pile. (A player in the top photo is doing the same.) They are also seen to be keeping a tally of the score with scratches or marks on the table, and a five of hearts is in play! (click on thumbnails to see whole picture). 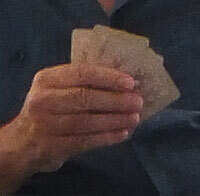 However, early paper was often very thin, and players had to hold their cards carefully to prevent their opponents being able to see through the cards. 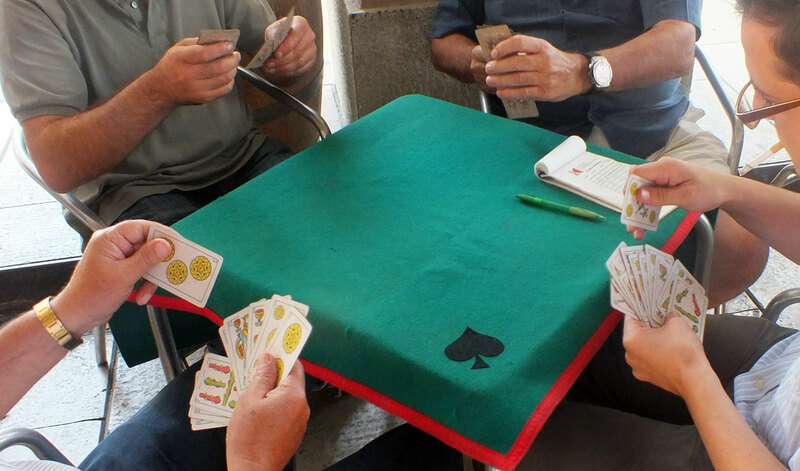 The Spanish practice of ‘pintas’, which would appear to facilitate identifying cards by their tops, as opposed to holding them fanned out is a relatively recent innovation. Nor did the early playing cards have index numbers, which is another logical refinement to satisfy a more ‘literate’ card player. 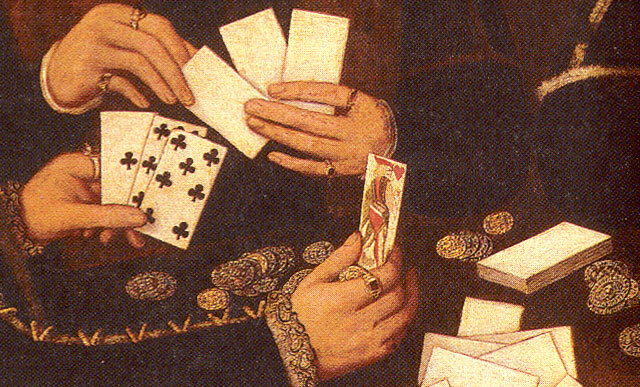 This all seems to imply that the manner of holding playing cards will reflect various cultural circumstances, such as levels of literacy, numeracy, modes of logical thought or categorisation, manual dexterity, secretiveness, skill at card-sharping, etc. 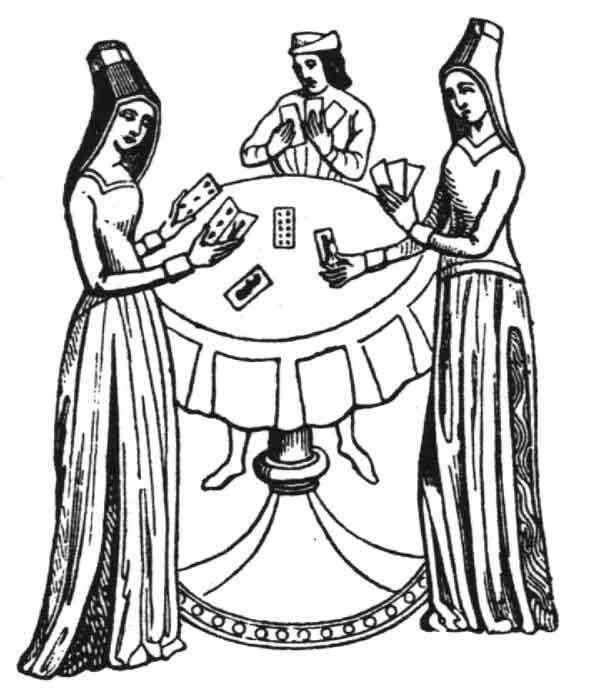 Playing cards are a sort of language, with their own syntax, grammar and meanings, requiring mastery of the logic, the deductive procedures and use of the memory. Watch how different people hold their cards during play! 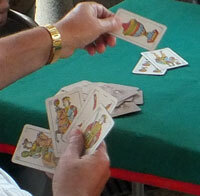 An example of oral expressions once made during play may still survive on Italian and Spanish playing cards, expressions which do not come from literary sources, but from the bar or café where card games were played. Note: Click on any thumbnail image to see the entire picture.